This is fork of tale-hugo. This is a port of the Tale theme for Jekyll to Hugo. Tale is a minimal Jekyll theme curated for storytellers. Checkout the demo here. 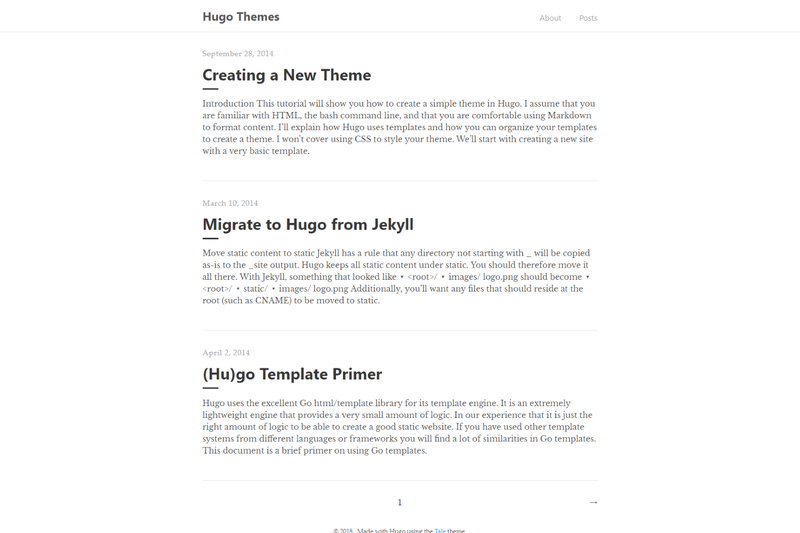 I did not design this theme; I only ported it from Jekyll to Hugo. For more information, read the official setup guide of Hugo. Feel free to submit pull requests for other translations of Tale’s texts. Tale allows for writing the summary of your posts manually by setting the summary variable in the page frontmatter. If this variable is not set, the summary that Hugo automatically generates will be used. Tale has basic support for taxonomies. Taxonomy and terms pages will be generated when you have defined taxonomies, but you need to include links to these pages yourself. For example, you can add a link to a taxonomy page in header-menu.html. These are included in the template for a single post, at the top of the post (below the title) and at the bottom of the post, respectively. These can be used, for example, to include additional information about the post author or for related posts. Create a file /layouts/partials/single/header.html or footer.html on your own site to have it included. This partial is included at the top of the list of posts on the index page, allowing you to add an introduction to your site. to lucperkins for the Fresh theme from which I used some useful snippets of code.